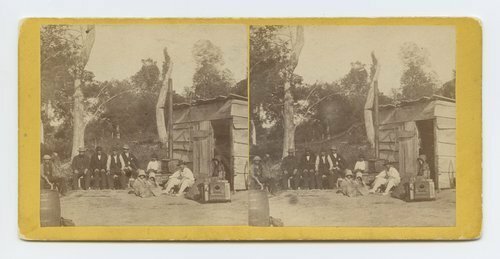 This stereograph shows the Hotel De Dutton near State Line, Kansas. A group of people are seated near the hotel and a wood burning stove and a large format camera are visible in the photograph. The image is from Alexander Gardner's series, "Across the Continent on the Union Pacific Railway, Eastern Division." Hotel De Dutton, near State Line, Kansas, 284 miles west of St. Louis, Mo.